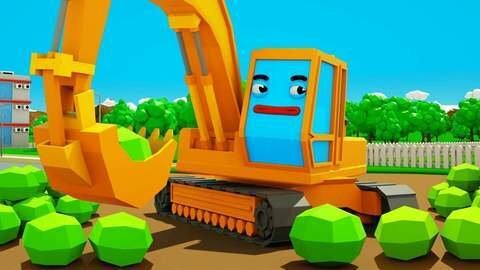 The sneaky tractor took the fruits that the excavator is busy fixing in this car cartoon for kids. Watch the excavators surprised face as it notices that there are only a few left. The tractor tries to make a run for it but the excavator throws eggs on to cover his eyes and it worked. Watch other fun videos of the naughty tractor and other 3D cars at SeeZisKids.com.